Is Light From Your Tunnel Fans Determining Your Birds’ Day Length? Broiler producers, especially those growing large birds (>6 lbs. ), often prefer to raise their birds under fairly low light. Low light levels, often less than 0.2 ft*candles, are typically sought in an effort to reduce bird activity which in turn will help to improve feed conversions, as well as reduce scratches and condemnations. 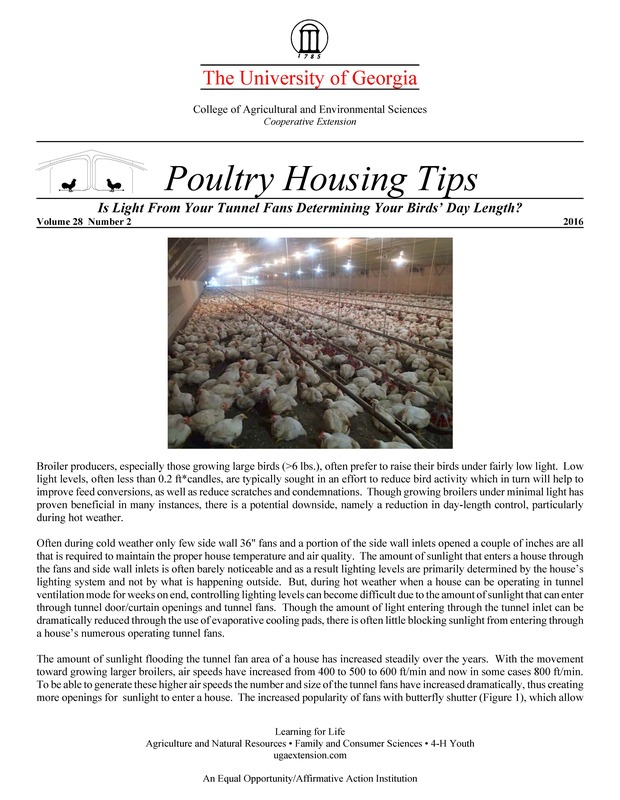 Though growing broilers under minimal light has proven beneficial in many instances, there is a potential downside, namely a reduction in day-length control, particularly during hot weather. Often during cold weather only few side wall 36" fans and a portion of the side wall inlets opened a couple of inches are all that is required to maintain the proper house temperature and air quality. The amount of sunlight that enters a house through the fans and side wall inlets is often barely noticeable and as a result lighting levels are primarily determined by the house’s lighting system and not by what is happening outside. But, during hot weather when a house can be operating in tunnel ventilation mode for weeks on end, controlling lighting levels can become difficult due to the amount of sunlight that can enter through tunnel door/curtain openings and tunnel fans. Though the amount of light entering through the tunnel inlet can be dramatically reduced through the use of evaporative cooling pads, there is often little blocking sunlight from entering through a house’s numerous operating tunnel fans.